This is a big one so you might want to grab a ‘gilassful’ of chai first (or a classy green tea, ladies, or maybe a lassi if you are a gabru). We all know Indian Passport isn’t one of the best ones out there (seriously guys stop making those countries where Indians can go without visa posts; why the hell I would go all the way to an island in South America? or an obscure country in Central Africa? Why not make an effort to get a travel visa to a decent destination, will ya?) in terms of visa free travel, but still there are many counties around the world where you can get in without much hassle. Luckily, for Indians getting a Thailand visa is a relatively painless process (given that you pay attention to this post). Thai visa for Indians is quick and easy, just keep in mind the below points. Thai officials are very strict on the documentation, so keep all necessary documents they ask for. Also, immigration/ visa rules can change anytime and it is best you check these rules directly from the official Thai Visa site before your travel. 1. Hotel Reservation Proof — An ABSOLUTE MUST. Thai Officials won’t let you enter Thailand if you don’t have one. Carry a printout preferably, but an email soft copy will also do, don’t take your chances though! Backpacker Tip#1: You can use booking.com to book for first night. Use the hotel address as the ‘Address in Thailand’ to fill up the needed forms. One night of hotel Booking is accepted, so you don’t have to plan your whole trip if you don’t want! Also, you can book hotels/hostels in booking.com without paying anything, just look for accommodation which don’t ask for credit card. Backpacker Tip#2: The wifi in both the Thai airport is pretty good and you can book through booking.com app right while standing in the VOA queue! 2. A colored passport size photograph — If you don’t have a photograph with you, no worries! You can get one clicked quickly in the airport itself (no selfies aren’t yet accepted ;)). Do note that these photo booths charge through the roof! 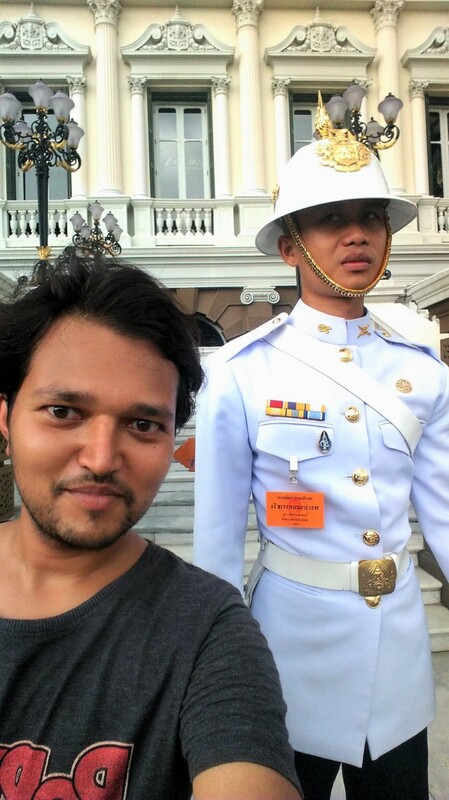 So, it’s better to carry one colored photograph for Thai Visa from India itself. 3. Bank statement — Good to have but not needed at all. I was never asked to show the proof of money. 4. Credit card — Although not asked officially on the Thai Immigration site but you should keep couple of them as proof of money. Just in case, you know! I was once asked for credit card by the visa officer as I didn’t have the hotel booking. 5. Cash — No, the Paytm doesn’t work in Thailand 😉 Only cash is accepted (sorry Modi no digital money yet! ), and only Thai Baht (THB) is accepted. No, not even USD is accepted (sorry Mr. NRI). You can get money exchanged in several of the exchanges in the airport which you will see on your way to the Thai VOA desk. 6. You need to fill in a Thai Visa on Arrival Form. This form is usually available on a desk near the VISA on arrival counter. Grab the form, join the queue and then start filling it in. Backpacker Tip #3: Carry a pen along with you! There are no pen available on the desk. Backpacker Tip #4: Don’t mess with the Royal Guard; he only likes well dressed gentlemen. To enter Thailand you need to go through the immigration (and also VOA for Indians). The immigration check is before the baggage claim so keep the necessary documents/ cash with you. 1. Keep couple of credit cards with you. 3. Carry enough Thai Baht (THB) to pay for the VOA. Not just that the exchange rate in the airport aren’t good but also you will end up losing time. Remember you need to rush to the VOA counter! 4. Get in the VOA queue first and then start filling the form. You will really thank me for saving you hours! Still confused? Get my travel tips/ hacks on Asia and beyond, subscribe to the newsletter.